Natural bolt-on perches. 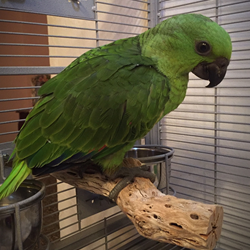 Please note that each perch is unique and will differ in shape (not size) from the perch pictured. Manzanita is one of the hardest hardwoods found on earth. Birds love to chew on things and most wood is no match for their sharp and powerful beaks. The 100% natural “Manzanita Superoost” is made from natural branches which usually come in irregular shapes and diameters. The Superoost is sandblasted to remove foreign matter and insure no sharp edges to damage your birds feet. Bring the rainforest inside! These mimic the branches the birds would be perching on in the wild. The varied terrain of the “Manzanita Superoost” is not only more enjoyable for your bird, but it helps exercise their feet and legs. Recommended for smaller birds, such as cockatiels, lories, conures, caiques and similarly sized birds. Recommended for medium birds, such as smaller amazons, greys, goffins and similarly sized birds. Recommended for medium birds, such as amazons, greys, galahs and similarly sized birds. Vet Wrap stretches and sticks only to itself and not to feathers or skin. Does not absorb moisture. Easily removed and easy to replace. Cool, lightweight and comfortable. Great for slippery perches. Can be affixed to Java Tree perches, too! Assorted colors of our choice. Natural wood corner perch is 10" in diameter. Great for smaller birds from Parrotlets to small Conures. Superb for special-abled birds. 10" x 5" x 1.5"
A perch with enrichment! Perch size is approximately 7" long. The end of the perch is adorned with a wood block stuffed with popsicle sticks. Once the sticks are gone, make this a foraging block! 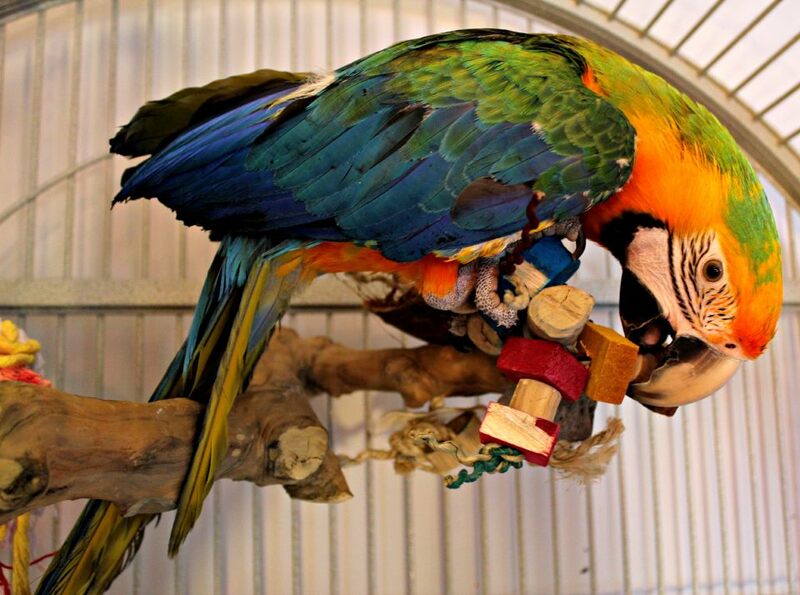 Recommended for smaller birds, such as caiques, conures, pionus and similarly sized birds. 8.5" in length with a total diameter of 6"
Polly's Pet Cholla Wood Perch for Birds will be a favorite for your bird. The irregular shape will help keep your bird's feet and leg muscles in tip top shape. Complete with Chew toys, this gym is recommended for cockatiels, conures, love bird, quakers and similarly sized birds. This all wood cage top play gym is approximately 12" tall, with perch diameters of 5/8". Made of solid pine with hard wood dowel perches. Comes complete with a swing, wood chew toys and natural wood caps. Mounts easily to cage with wing nuts and washers. This all wood cage top play gym is approximately 16" tall, with perch diameters of 5/8" and 1/2". Posts are 9", 13" and 14" tall. Outside dimensions are 12" x 12". Made of solid pine with hard wood dowel perches. Comes complete with a swing, wood chew toys, a 14 1/2" ladder and natural wood caps. Mounts easily to cage with wing nuts and washers. Please click the picture for additional views. A bolt-on sandblasted java branch decorated with earth-friendly toys made from wood, bamboo, sisal, coconut and even an oyster shell! Please note that each perch is unique and will differ in shape (not size) from the perch pictured. Sandblasted Java Wood natural bolt-on perch. Please note that each perch is unique and will differ in shape (not size) from the perch pictured. Large - recommended for Medium to Large birds.